A few of us are honour to get an invitation from Ms. Ann to try out their Mid Autumn Romantic and Reunion Package. It is for 2 person and 4 persons package. 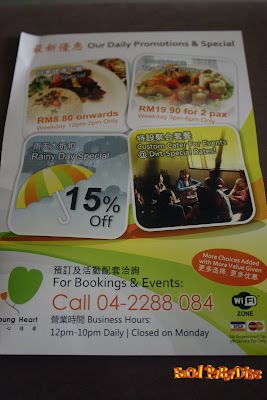 I was invited to Young Heart beginning of this year to try out their Chinese New Year dishes. Which you can view from here. Ok..... now back to the main point here. Young Heart changes some of the menu about 2 months ago but they still maintain some previous dishes. From the colourful menu, you can see there are lots of new varieties to choose from. I am sure that there are something that will suits your taste buds. After the appetiser, next came the deep fried Young Heart Chicken Wing. You can taste the crispiness from the outer part of the chicken wing and tender in the inside. I would recommend that you should take this with rice or noodles as I personally think that it is a bit salty to eat it as a snack. I tried this dish in my last review. And still in love with the snake squash and the quality still maintain the same. Off course we should have some greens to go with the package to keep every one healthy. I loves this dish, It looks simple right. All the ingredients are cook to perfect timing. So the broccoli and enoki mushroom is not over cooked. 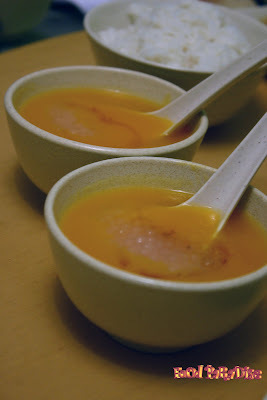 The desserts for both package are golden osmanthus pumpkin pudding. If you loves pumpkin, this would be your choice. The desserts is not sweet at all. Which is good for healthy lifestyle. Thanks to Ms. Ann, we would be able to see the Osmanthus flower. It smells very nice and it is almost the same smell like the green tea. Very refreshing! For both Mid Autumn packages, it will comes with home made mini moon cakes hand made by Young Heart. And interestingly, we had "SAMBAL" home made mini moon cakes for the night. Have you tried that before? Well, the interior is dry sambal. As the outer moon cakes is rather soft compares to other hand made mini moon cakes. I loves this noodle especially the noodle textures. Once you try it, I think you will fall in loves with it. From the look, it looks quite plain. The noodles just accompany with some hint of sesame and soya sauce. But please try it out yourself then you will know. This is highly recommended for those of you who loves springy textures of noodles. We start off by having the soup of the day. And for that night we had Green Papaya Spare Ribs Soup. I fall in love with this soup after the first sip. It is something clear and sweet. It's taste like some winter melon soup. 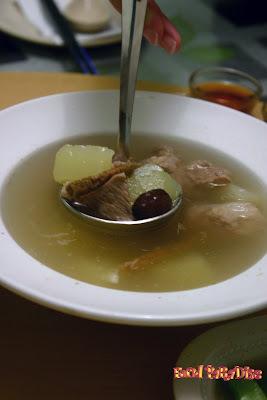 One of us mistaken thought that it is winter melon soup. ^-^ And the spare ribs are very tender. One thing we found out from Ms. Ann is that the soup is cooked using "Charcoal". Yes.... you heard me..... it's charcoal. So give it a try of this soup! Out of the five dumplings, my personal favourites would be the pork, prawn and scallop dumplings. 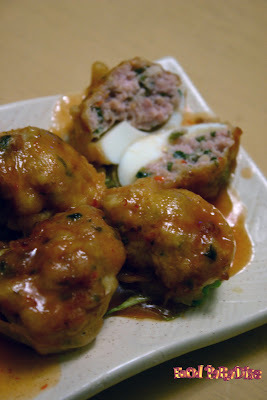 The ingredients in the dumpling taste very juicy and tender. Others dumpling tastes nice as well as with some vegetables add on it. Which again make healthy balance intake for our body. If your child cannot take spicy foods, this would be a very nice choice for them. Some combination of sweet, sour and salty flavours. I think every one of us enjoy this dish very much. The pork chop is very tender. Some people loves steam fish and some loves deep fried fish. So this is the dish that can satisfy both type of taste bud. 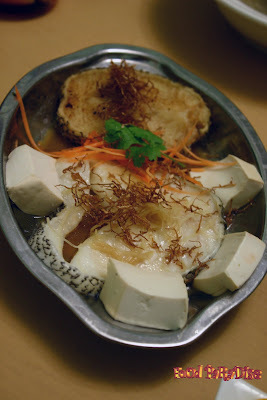 On my last visit, I have tried the steam cod fish and it still maintain its flavor there. For the deep fried cod fish, it's my first time trying this in this shop. I enjoyed it. As it still maintain so crispy after a long wait for us to shoot the foods. So imagine that.... it still tastes good. For the desserts, it is the same as the Romantic Autumn package. That is 心花怒放 (桂花金瓜露) Golden Osmanthus Pumpkin Pudding and公仔饼Home Made Mini Moon cakes. 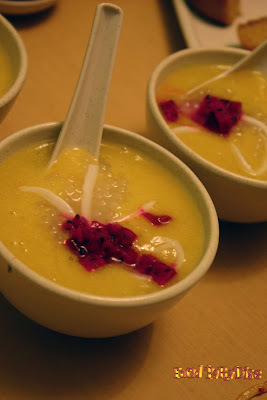 As for the desserts, if you like to change the Golden Osmanthus Pumpkin Pudding to 芒果花園Mango Puree &amp; Sago Pudding. You just add on RM1 per bowl. This is best to eat it while it served hot. as the brinjal is deep fried and it tastes very crispy. And with the sambal seafood. It is awesome! I would suggest that you give it a try if you like brinjal. Another dishes to be mentioned here is the fiery hot noodles. Actually, don't be scared of the name of the noodles ~ Fiery Hot. As you can adjust the spicyness yourself. But be warn that we just add a bit of the chilli in the bowl of noodle. And have a look at the photos, it turn slightly red already. Not to mention the tastes. ^-^ I found a bit spicy but still I enjoyed it very much. I would certainly go back for this. 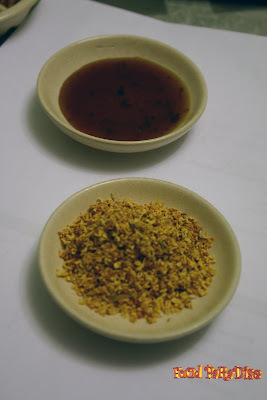 The combination ingredients are nice and the noodle used are also hand made noodle. 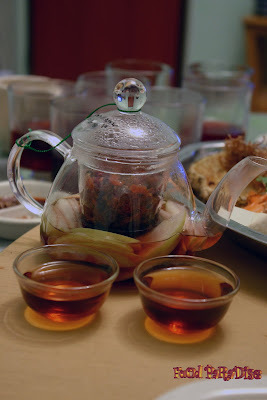 Since every one know Pu Er Tea. I am not going to elaborate much. But the Rosehip, Hibiscus, Green Apple ~ RM9 per pot is something that I never try before. How it tastes like? hmm.... a bit sour and also have the hint of green apple tastes. If you worry about sourness, not to worry as it comes with sugar syrup. 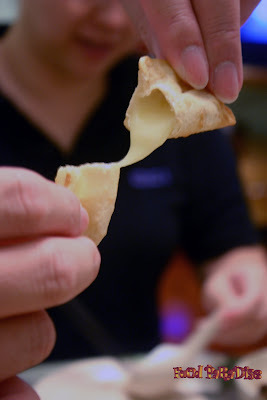 But each of us having this with the original tastes as we found that it is acceptable for our tastebuds. Location: No. 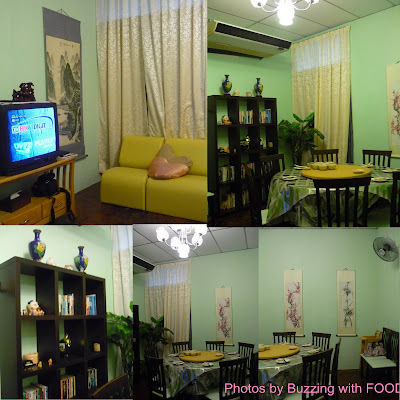 44A, Jalan Cantonment, 10250 Georgetown, Penang. I also post the same question as NKOTB -SOoo many dishes for a few of you?! I love the names of the dishes, so lovely for the valentines one! walio so many food, great company! lol!od review! everything in here looks yummy! So many delicious food for you guys. Next time invite me lah.... i.e if I'm in Penang! J2Kfm - In your next trip here, perhaps you can try it out! SimpleGirl - Wow.... that's great. At least something attracted you after reading my posts. 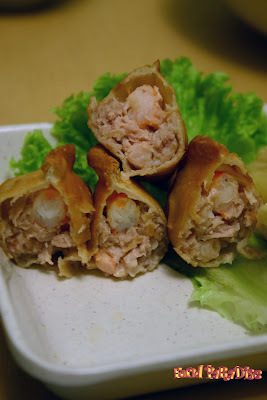 ^-^ Give it a try when you come Penang ya! Seems to be Penang blogger's favourite. Wow, I think this place is great judging from the food shown by you. I wish I can sample these foods in the near future.. Happy holiday.. I want the Fiery Hot Noodles!! That's the only thing that looks remotely unhealthy! HAHA!